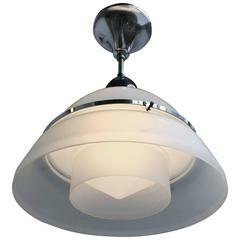 1920s Bauhaus style light fixture with original rod and canopy. This stunning pendant is in very good to excellent condition and thanks to its shape this timeless piece of lighting art can be used in various kinds of interiors. With a two-piece shade and three glass inserts this is one of the most unusual and interesting pendants that we have ever seen. 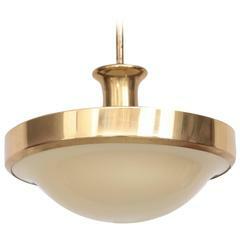 This extraordinary design feature gives this light fixture its extra depth and beauty. The combination of the opaline & clear glass and the beautiful patina of the brass ring makes this pendant an absolute joy to look at, both on and off and wherever you may decide to hang her. This very rare and marvelous pendant will be rewired for safe and immediate usage the world over. Again great value for money. Especially when taken into account that perfect packing and worldwide delivery from our store to your door in just 4 days are complimentary. Maximum height x diameter: 23 x 12 inches. We have a passion for the unique, for quality, for stylish yet practical and for craftsmanship of years gone by. Your purchases will be extremely well packaged and we look forward to serving you (again). You can shop all our 1000+ listings by pushing the button that reads 'View All From Seller'. Please also read our item description. Wear consistent with age and use. Shipping methods are determined by item size, type, fragility and specific characteristics. Shipping costs are calculated based on carrier rates, delivery distance and packing complexity. This item can be returned within 7 days of delivery.